Summary: When Dayraven finds the Torc around her neck, a special symbol of leadership among her people, the Brondings, she doesn’t want it. With plans to be a healer, Dayraven resents the new role she must assume, seeking vengeance for Sigurd, the previous Honour of the Brondings. But it turns out Sigurd isn’t dead after all, and if Dayraven can track down the person who tried to kill him, she just might be able to go back to pursuing her dreams when she’s done. And by doing so, Dayraven will prove to her people that women can be warriors too. Review: Ann Ewan thrusts her readers into a world where each of the seven clans are represented by someone called a Honour. I thought I would be confused but I wasn’t, because Ewan does an excellent job of setting up the politics and characters required to support her story. Instead I found I was rooting for Dayraven because although she finds herself in a situation she absolutely doesn’t want to be in, she still accepts the responsibility placed upon her and follows it through. Knowing it’s the right thing to do based on how she was raised helps her, but when she does get the chance to follow her dreams, she takes it. I loved that for a fantasy book, it was relevant to everyday life. Dayraven lives in a paternalistic society and when she finds herself the Honour/leader of her clan, everyone is surprised not just because she is young, but because she’s a girl. No one including herself thinks she should be Honour, but she changes people’s perspectives when she completes her task so efficiently. Caught between her career/dreams/family, she takes time away from her family at first only to realise if she is going to follow her dreams, she needs her family by her side. I liked it. My favourite part though was the precision with which Ewan creates different dialects for the clans. It was believable and intriguing and I loved how it helped me really get into Ewan’s characters. ‘She’s the best fighter you’ve got, right?’ someone shouted. ‘The smallest Bronding child is a better fighter than most of ye!’ Thorstan yelled. Dayraven suppressed a smile. 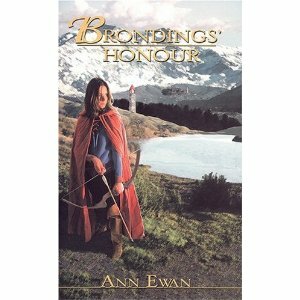 Brondings’ Honour by Ann Ewan is published by Thistledown Press, (2006).